⇒20% Discount for all room rates/ stay from 1st November until 1st February 2018! Click Here to Contact US! 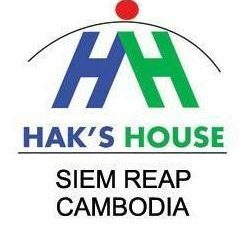 NOTE: Our location is: Street 52, Wat Chowk Road, Phnear Chey Village, Svay Dangkum Commune, Siem Reap, Cambodia, 17252. Please call us for arranging the free pickup. It is so importance to get free pickup from us. Our family wish you to arrive with smile to our house. Our 24/7 contact: Email:reservation@hakshouse.com or My direct Whatsapp & Line Number: +85512540336. Please book at least 2 nights to get the free pick up from the airport, bus station or boat dock. Thank you so much for your stay! Mr. Hak and his family would like to invite you to come and try our hospitality and comfort at our house, with a greenery tropical , quite and lovely garden sou rounding our entire house and swimming pool where you can have a total relax and peaceful mind after a long hot day at the temples or the busy and noisy downtown. Hak’s House is close to airport, downtown, museum and Angkor Wat. You’ll love my place because of the views, the ambiance, the people, and the location. Hak’s House is good for solo, couples, families (with kids), and groups. We offer all guests spacious, quiet, comfortable, and clean rooms. Our area is peaceful, calm and quiet that will make your stay even more enjoyable and relax. Our house sou rounded by beautiful lotus farm, friendly neighbor, and great view for sunset on our amazing roof top . We are just 2 kilometers from the busy & noisy downtown and it is very easy to get there with tuktuk or bicycle. Our family welcome you to our home. FREE PICKUP & IMPORTANCE READ THIS! Note: If tuk tuk drivers inform you we are closed, full, under renovation or whatever else, please ignore them and ask to be taken to Hak’s House. We recommend you to take Capitol Tour Bus company to Siem Reap because we are about 5 minutes from Capitol Tour Bus Station. We will pick you up for free of charge. Please, you must email or call us 24 hours before your arrival. Our free pickup is available from 6AM to 9PM only. Other than time of arrival, we will charge 4USD. Thank you so much for using our service. We always to provide our very best and conveniences to our costumer.